I recently reviewed the book, Shiver, by Maggie Stiefvater and I commented at how this book changed many of my preconceptions about this novel and the genre. I had planned to pace myself when I decided to begin reading Linger, but I quickly found myself diving into the book and I found it difficult to pull myself away from it! In the course of the first novel, Sam and Grace are the focal points of the novel with the story being told exclusively from their two points of view. 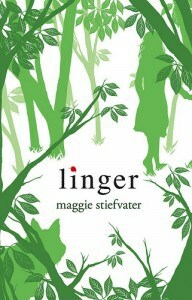 In Linger, Sam and Grace are in the forefront but two other characters (Isabel, whose brother died in the first novel and Cole, who was turned in to a wolf by Sam’s adoptive father) also participate in narrating the novel from their vantage point. Life should be easier for Grace and Sam – Sam is no longer a wolf and the couple are planning their future together. Grace finds herself plagued by some strange symptoms (a high fever and nosebleeds) but she wants to ignore these problems to focus on her life with Sam. Sam finds himself having to deal with some issues that emerge, including a young wolf (Cole) who has turned long before he should. Cole also has some secrets in his pre-wolf past that he doesn’t seem keen on sharing and he is fixated on avoiding his problems by trying to discover how he can morph back into his wolf state. The plot intensifies as Grace’s parents find seem in her room at night and try to separate the couple. Both Sam and Grace are terrified at the idea of being torn apart – after all, they’d worked together so Sam could become a human so they could be together! When I began reading the novel and found Isabel and Cole taking part of narrators in the novel, I was concerned that it might not be as good as the first novel. Stiefvater showed me, again, that I should assume nothing and that she is a wordsmith extraordinaire! Without giving away the ending of the novel, I found my response to this novel as powerful as it was to the first novel and my desire that Sam and Grace live happily ever after surprised myself!